The Japanese Ministry of Education, Culture, Sports, Science and Technology (MEXT) have announced details of its 2020 university admissions reforms. The current entry test for public and national universities (which is also used for many private universities) is the National Center Test and was taken by 560,672 high school students in 2016. The test is taken over a 2-day period and consists of multiple choice questions, covering Civics, Geography & History, Japanese Literature, Science, Maths and English. In order the encourage what MEXT calls ‘powers of thinking, judgement and expression’, and a washback effect in teaching approaches and methodology (i.e. a move away from rote learning), several examination reforms will come into place from 2020. However, changes in the English part of the examination have been delayed, and there will be a transitional phase from 2020 to 2023. The main reason for the changes in the English test can be shown in Fig. 1 below. 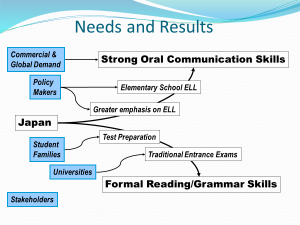 Although strong oral communication skills are desirable for Japan’s export-driven economy, traditional entrance exams oblige students to master ‘passive’ skills, such as reading and grammar, but do not encourage creative or productive skills, such as speaking. Fig. 1 Adapted from a slide presented by Professor Jared Bernstein from Stanford University. Students are therefore taught to achieve success in traditional multiple-choice language examinations, and subsequently emerge from 6 years of junior and senior high school instruction with very poor English-speaking skills. In the era of globalization, this has recently been perceived as a national embarrassment – particularly brought into focus with the forthcoming Japan 2020 Olympic games. Fig. 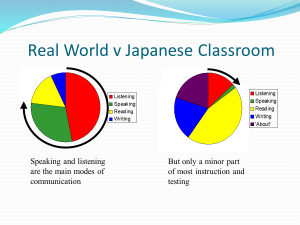 2 below represents how we use the 4 skills to communicate in the real world, and what actually takes place in a typical Japanese English language classroom (note: ‘about’ = explanations about English in Japanese e.g. grammar rules). By reforming the English language university entrance examination, MEXT hopes that English teachers will focus more on ‘real world’ oral skills in the classroom. Fig. 2 adapted from a slide created by Professor Harada at Waseda University, Tokyo. However, MEXT has backtracked on its proposal to eliminate the Center Test’s English section entirely, bending to pressure exerted by various university and teaching associations, who all requested MEXT to delay the plan. A compromise, transitional period, from 2020 to 2023, has therefore been introduced before the full introduction of a 4-skills English test in 2024. In the meantime, universities can choose to admit applicants based either on the new Common Test’s English section or private-sector English tests that assess speaking, writing, listening and reading – or both. Students will be able to take private English tests twice between April and December during their final year of high school. Testing companies will send candidate results to the National Center for University Entrance Exams, who will then forward the test scores to universities. These examination reforms should gradually bring about an improvement in the productive use of English language in Japan, but this will take time. Teachers will have to upgrade their English Language proficiency – particularly their speaking and listening skills. Japanese teachers of English will have to familiarize themselves with the eligible tests. John Lowe is the Garnet representative for Asia, and has been based in Tokyo since 2000.